A few years ago I used to grow herbs in pots (pot herbs: perbs) and witter on about them at great length. Recently I decided to start growing things again, this time brightly-coloured and sweet-smelling to attract wildlife (and hide the air conditioning unit). So far—and it’s only been a couple of weeks—I’ve seen dozens of hummingbirds (or maybe the same bird dozens of times), two kinds of bee, three kinds of butterfly, and countless other winged things (beetles and flies of every variety). Mostly I get so lost in looking at the colours I forget to take photos but I’ll to remember to take pics every now and again as things grow. And I’ll do a better job of the photos. 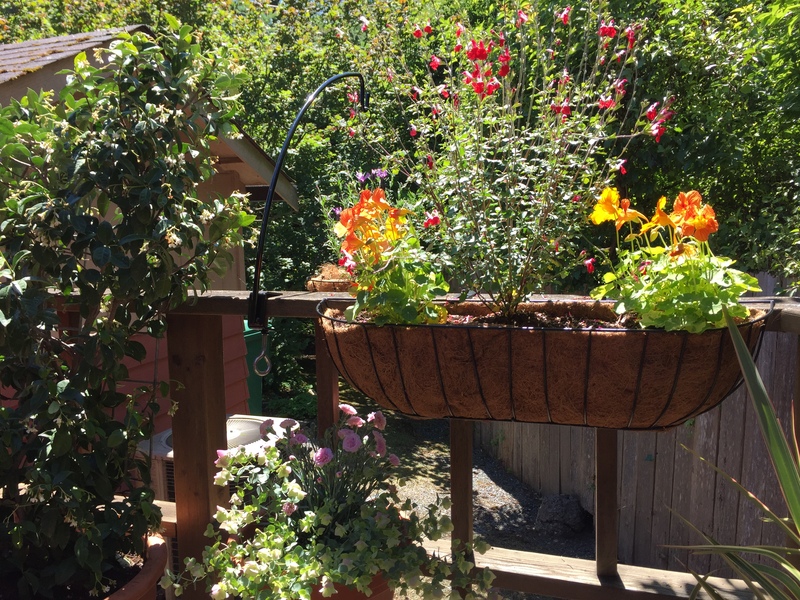 Here for starters are (left to right) jasmine, ornamental oregano and carnation, nasturtium and Salvia (the Flaming Lips variety, which hummingbirds love). There’s some other stuff but I we’ll get to that later. Anyway, enjoy. I certainly do!